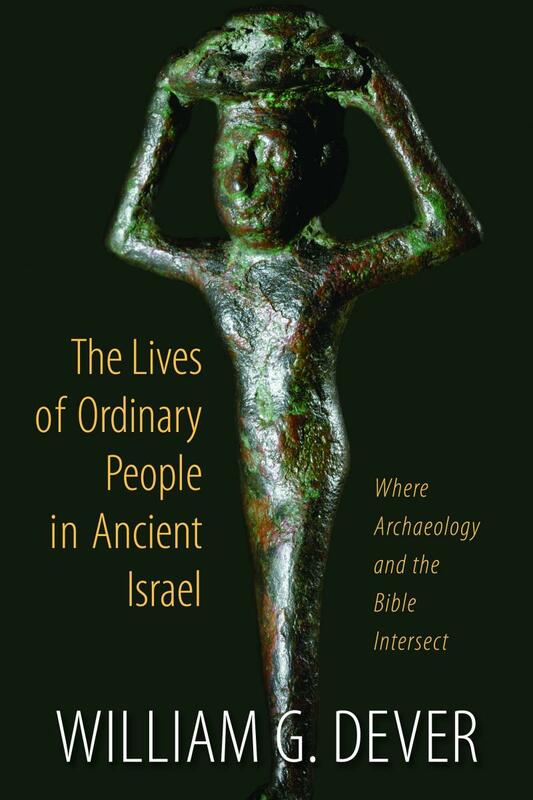 Dever, William G. The Lives of Ordinary People in Ancient Israel: Where Archaeology and the Bible Intersect. Grand Rapids: Eerdmans, 2012. William Dever has made something of a career criticizing the revisionists who deny that ancient Israel even existed. What Bart Ehrman is to the Jesus Mythicists, William Dever is to the Israel Mythicists. Both are skeptics who reject all of the miraculous and much of the history in the Bible, while refusing to go over the cliff into absurd denials of well-established historical facts about their respective subjects. In this book, Dever focuses on eighth-century BC Israel (the period covered in 2 Kings 12-20 and 2 Chronicles 24-32) and involving the prophets Amos, Micah, and Isaiah. Dever argues that archaeology corroborates some historical elements in these sections of the Hebrew Bible (or Old Testament), but that the Hebrew Bible adds little or nothing of importance to an archaeologically based history of ancient Israel. Dever says that he reads the Bible “simply as another written record,” though he immediately remarks that the Bible contains “miraculous stories that defy reason” in addition to theological biases and contradictions both internal and external (3). He has no use for fundamentalism and only some respect for evangelical scholars, whose efforts to defend the historicity of the Hebrew Bible he characterizes as generally lacking in engagement with the archaeological data (22-24). His marginalization of evangelical scholarship is evident in such statements as the following: “And there is unanimous agreement that the prophetic books above [Isaiah, Amos, and Micah] were produced not by the 8th-century individuals (?) whose names they now bear but by later prophetic schools” (99). Dever’s stated methodology is to give priority to the archaeological data over the biblical text (e.g., 98). His approach is such that at one and the same time, he confirms elements of the biblical history with one hand while taking away its historical value with the other hand. Where the data and the text agree, Dever argues, we can and should accept what the text says. For instance, the cuneiform Neo-Assyrian annals concerning the campaigns of Tiglath-Pilester III in 745-727 contain a reference to the first three cities the Assyrians encountered on the northern borders of Israel: Ijon, Abel-beth-maacah, and Janoah, obviously in geographical order. It happens that our presumed historical sources in 2 Kings list precisely these three sites, in the same order (15:29), and they attribute their destruction to Tiglath-Pileser (III). That convergence cannot be coincidental (99). 2 Kings 15:29 also mentions “all the land of Naphtali,” a reference “exactly parallel to Tiglath-Pileser III’s ‘wide land of Naphtali’” (100 n. 60, citing ANET, Pritchard, 3rd ed. , 284). Dever goes on to survey briefly place-names in 2 Kings not known from archaeological investigation, pointing out that these cannot be confirmed by external evidence. He concludes that the Bible here “adds little or no genuine historical information to our archaeologically based history,” which is why “we may consider archaeological evidence as the primary data” (104). As best I can tell, Dever’s argument is viciously circular: the biblical references add nothing to his “archaeologically based history” because it is archaeologically based! Dever thus acknowledges that there are cases “where we can make a correlation between archaeological data and the biblical text,” but he argues that the texts contribute “not much, and nothing essential, or even helpful,” that is unknown from archaeological findings (247). “A fair-minded observer, free of biblical or anti-biblical bias, can only conclude that the archaeological evidence must  now take precedence. In other words, it is the artifact that illustrates and ‘corroborates’ the texts, not the texts that corroborate the archaeological data. These artifacts do not need corroboration” (247-48). While Dever’s contributions in documenting the historicity of much of the Old Testament text should be appreciated, his method explicitly denies the historical value of anything in the Bible that is not independently learned through extrabiblical sources. Yet he gives no good reason for this methodological constraint; what reason he does offer is question-begging in the extreme. Even where archaeology shows the historical cogency of a biblical text, Dever churlishly denies that one may infer that the event took place. For example, Dever points out that he had shown in an earlier work “that we now have archaeological data to illustrate and document almost every single item that Josiah is said to have thrown out of the Temple in 2 Kings 23.” All this does, he says, is “supply a ‘real-life’ context for such reforms,” not show that “they were actually carried out” (289). On what basis, though, would someone like Dever be skeptical of the account in 2 Kings 23? The text at this point is not even asking the reader to accept a supernatural occurrence. This refusal to accept the historicity even of natural events reported in the Bible unless external facts force such acceptance is not rational. The Hebrew Bible, written by elitists (and propagandists), is an ideal portrait, not of what most people actually believed and practiced, but of what they should have believed and practiced—and would have, had these theologians, these nationalist orthodox parties, been in charge…. Sometimes the two sources converge, but more often they do not. The disconnect between artifact and text means that, ironically, it is the biblical texts that condemn folk religion that best illustrate it. Thus the religion of the masses consists of almost everything that the biblical writers forbade (287). Dever’s argument here attempts somehow to turn biblical statements denying the legitimacy of disapproved sites into denials of their popularity. This does not follow. The Hebrew Bible condemns popular practices in Israel precisely because its authors recognized that those practices were popular. They do not present “an ideal portrait”; if they had, they would not mention the practices they condemn! Dever confusedly states, “The Hebrew Bible does mention cultic installations in general, but only to declare that they must be dismantled, or to deny that they even existed. References are too numerous to mention, mostly in Kings and the prophetic works” (287-88). There are plenty of references to the cultic sites needing to be dismantled, but none denying that they existed. The biblical writers’ lack of attention to the fall of Lachish in 701 (mentioned only in 2 Chronicles 32:9) is “astonishing” to Dever, who claims that their lack of any narrative concerning the deaths of the people of Lachish “disqualifies these writers as anything like reliable historians” (367). But all history is selective, even Dever’s. His real problem with the Bible here is that he finds the Bible’s accounts of Jerusalem’s miraculous survival of Sennacherib’s siege unbelievable (366-67). Dever concludes, “The biblical data contributed so little of substance that in most cases most of it can be eliminated as a truly historical source” (376). He admits that this is a “minimalist” conclusion and dismisses the objections of “fundamentalists” as driven by their dogmatic faith. As has been explained here, however, Dever’s conclusion is itself driven by a dogmatic commitment against the biblical worldview that leads him to deny the historicity even of naturally explicable events reported in the Bible.